There is so much change going on around us, whether it’s technology, search engine algorithm updates or the needs of our target customers. It isn’t necessary to keep up with everything, but there are some things that can have a major impact on our careers or businesses if we aren’t prepared for them. In this episode of The New Music Industry Podcast, I talk out lout about some of the recent changes that have impacted my business and what I’m thinking about doing moving forward. 02:29 – Time to hire? Whenever I record a podcast episode, I like to prepare some thoughts and ideas that will benefit you in some way. I don’t think today’s show will be any exception, but unlike previous episodes, this is going to be one where I’ll be thinking out loud a little bit because I don’t have a concrete action plan for how I’m going to move forward just yet. You might benefit from hearing me think out loud too. Since about August 13, which was my birthday, I’ve been seeing a marked decline in traffic to the website. Up until that point, I certainly saw some fluctuation, but overall it was on an upward trend. But recently, the traffic essentially halved. I know that Google is constantly updating their algorithm, so I’m sure that plays a part in this decline. I’m also aware that my website has certain issues that could affect its rankings. So, that’s one of the things I’m beginning to think about tackling in the coming months. A decrease in traffic isn’t necessarily something to be alarmed about, and there can also be other factors, such as the fact that it’s still summer. But I want to continue to get my message out there to as many people as possible and don’t like sacrificing in that regard. Now, I’ve shared before that I like to mitigate risk and build more than one traffic source. This might be an opportunity to explore that idea a little further as well. I could better utilize platforms like YouTube, Instagram and Facebook to connect with my audience. My website is my home base and that’s what I care about most, but these platforms can certainly support my efforts to share my message. I could also advertise on these platforms. Something else that’s been floating around in the back of my mind is how to manage my time. As you probably know, I spend a lot of my time creating content. And, when I have a product to share with you, generally it’s a course or a book or an eBook, unless it’s an affiliate offer. I like spending my time creating content, as I think it’s more effective than sharing my ideas with one person at a time. When I publish a post, it reaches many people. But because of how I’ve structured my life, most of my time ends up being spent in the business instead of on the business. This isn’t to suggest I don’t want to create more content. The reality is that I have more ideas than I can realistically keep pace with. I have so much more to share with you. That’s a good problem to have, and I’m sure some content marketers wish they had that problem! This is where you say I should begin hiring and bringing people on to handle some of the workload, and you wouldn’t be wrong in saying that. Personally, I would like to see some of my revenue streams build a little more before I look at hiring, as I tend to be conservative with spending. But it might just be a matter of overcoming that mental hurdle. And, don’t kid yourself – we all have mental hurdles to overcome. But back to what I was saying about how I use my time. One thought I had recently was alternating months between creation and curation. So, I would spend one month just flat out creating content and the next month marketing, organizing and repurposing that content. I think this would be a good way to get more leverage out of the content I’m creating, and it would also allow me to spend more time on the business instead of just in it. It would allow me to work on bigger picture things like SEO as well. I’m not sure how this would affect the production of content. In some ways, it might make me more prolific. At the same time, if continually producing and publishing more content doesn’t boost numbers, then it’s not benefiting me. Slowing down and resetting might be a good idea. Do you have any thoughts on this? Would it be okay if I cut down on the amount of content I publish for a while? 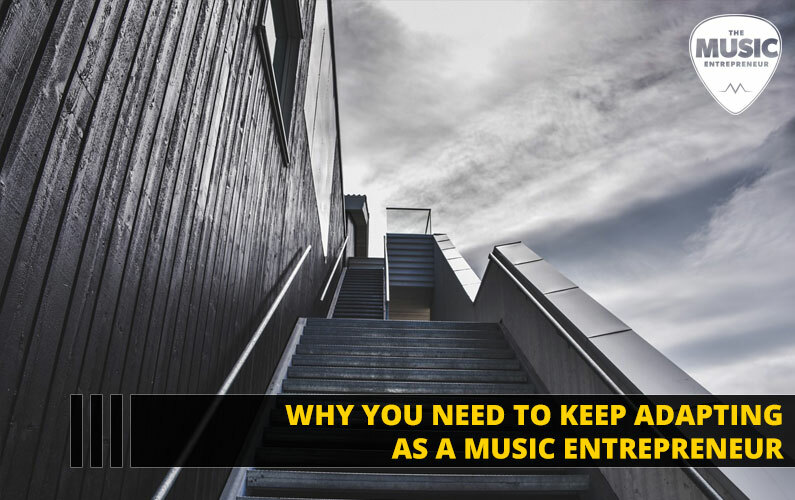 Would it affect your overall experience of The Music Entrepreneur HQ? Either way, I think it might be helpful for me to slow down and reset. Take a close look at everything, reaffirm the vision and mission of the business and determine the best course of action. Another thought that has crossed my mind is that perhaps it’s time to redesign the website. I wouldn’t necessarily do a complete overhaul, as I’m relatively happy with how things are set up. These days, it’s quite common for developers and companies to take a more continual and iterative approach to design, changing bits and pieces as best practices and trends change. I don’t think there are any major issues with my website speed, but I know for sure more could be done in terms of conversion. Now, I will say that traffic isn’t everything. I have no data to back up the idea that I’m converting a higher number of sales because I get more traffic. I’ve seen some of my affiliate income go up, but overall there hasn’t been a huge change. That’s another issue I’m working to solve. Engagement hasn’t been where I’d like it to be. I’ve taken some steps to improve that, but I would love to see more interaction. I would love to see more comments and emails. I would love for you to tell me what you’d like to see more of on the website, because I can easily get lost in my own thoughts about what I should be creating. I want to be making a difference. If I’m not connecting with you, I’m not doing my job. There are a lot of ways I can help – such as with websites, graphic design, music distribution, self-publishing, finding revenue streams, and so on – but this is more about what you need as opposed to what I think you need. So, another thought I’ve had is to create more videos. There are a few people that have pointed out the lack of video content on the site, and to be fair, I’ve put far more energy into blog posts and podcast episodes through the years. Fundamentally, I want to create a personal connection with you and add value to you. It’s not hard for me to create talking head style videos, though it does require more of my time and effort. Mind you, if you think it would benefit you, I don’t mind putting more energy into it. If there are other styles of videos you would enjoy, you can certainly let me know. So, those are some of the thoughts that have been rolling around in my mind. As always, I don’t know what’s going to work. The only thing I can do is to see this as an opportunity to tighten up what I’m doing and make it into something better. The key lesson here is that if we don’t adapt, we’ll be forced to adapt. It’s the same thing I shared in my first book, The New Music Industry: Adapting, Growing and Thriving in The Information Age. Now I get to eat my own words. But again, I think this is a positive thing. It’s causing me to reevaluate what I’m doing, and course correct. Instead of just plowing ahead as I always have, I’m zooming out to see the bigger picture. All of this must be examined alongside my vision, which needs to be more clearly defined. So, you might be seeing some changes around here as I put together a plan and execute against it. I’m excited for what’s to come, but I would love to hear your thoughts on this as well. What would you like to see most on the website, and on a grader scheme, how can The Music Entrepreneur HQ benefit you? How can I help you get the most out of your involvement with music?